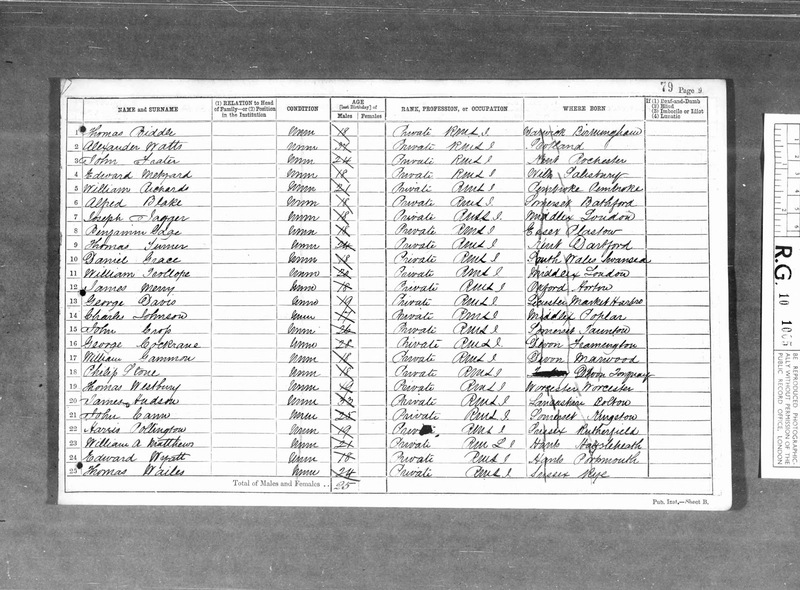 Well now I know that my great grandfather George Cockram deserted from the Marines, although I don't know why, nor why he joined up in the first place. But since my last blog post, I've learned a little more about this period of his life, thanks to Kevin Asplin, a researcher at Forces War Records in England, who dug up what little there is of George's military record. According to the Royal Marines Service Register, George was recruited on the 27th of February 1871 at Barnstaple, Devon, not far from his home town of Fremington, into the Plymouth Division of the RM. His entry in the register says he was 18 years and 9 months old, when in fact he was 19 and 9 months, and this mistake probably explains why he was said to be 23 when he deserted, instead of 24. At this time, Britain was not at war, so recruitment into the armed forces wouldn't have been overly energetic. But the Royal Navy did need to maintain its superiority over all others, and patrol the vast British Empire, which required the services of marines as well as sailors. So the Royal Navy and the Royal Marines had recruiting officers all over the country looking for young men eager to volunteer. No doubt there were enticing recruitment posters promising adventures at sea, good food and high wages, but I haven't found any for this period - earlier and later, yes, but not during Victoria's reign. So did George volunteer on the spur of the moment, when he just happened to be in Barnstaple and happened to come upon a recruiting sergeant? Or did he consider it for awhile, and go to Barnstaple specifically to join up? Can't answer that one. Judging by family memories of George's love of the sea, it's not surprising that he was attracted to the RM - but why didn't he join the Navy instead? Perhaps because sailors had a pretty rough life, whereas a marine got a splendid uniform and didn't have to do much in the way of manual labour. Marines were primarily ship based infantry, and seafaring skills were not required. Two days after signing up and having a medical examination, George was in Exeter, where he was sworn in to the Royal Marine Light Infantry for a period of 12 years. From there, he was sent to B Company in Walmer (Deal), Kent, for training at the RM Depot there. The training was mostly land based, using similar weapons and tactics to that of infantrymen, to prepare the recruits for guard and sentry duties, maintenance of discipline, enforcement of rules aboard ship, and for fighting both aboard ship and ashore. 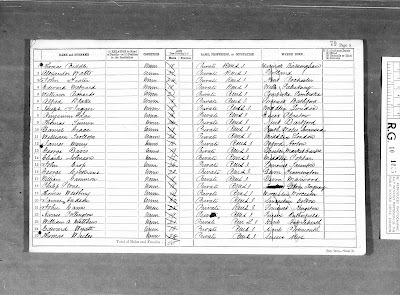 George is on line 16 of this 1871 census page, one of hundreds of marine recruits at South Barracks. In November 1871, Private George Cockram was sent to Plymouth to join the 63rd Company of Royal Marines at Stonehouse Barracks, known as the spiritual home of the RM. At some point, he was transferred to the 35th Company, and was with them on the 1st of March 1873, when he received a Good Conduct Badge, known as a Mark. (This is indicated in the Register entry above, in pencil under his name: 1 Mark 1 March 1873) The badge was an inverted chevron worn on the left forearm, and was awarded after the first two years of service with a performance level of at least 'very good'. Further badges could be earned after another 3 years, then 5 years, and a marine with 3 badges and at least 10 years of service got a Long Service and Good Conduct Medal. But George didn't stick around for that. The Good Conduct Badge brought with it an increase in pay. As a private, George's pay would have been around 22 pounds a year, and the GCB would have earned him an extra 1 penny a day, or about 1 pound, 6 shillings a year. Compared to other occupations, even farm labouring, the pay was low - but George didn't have to pay for his food, lodging, clothes, or anything else really, so he could easily have saved most of his income. So there he was, earning a living, probably spending some time at sea and obviously not getting into trouble - there would be a record of him losing his GCB if that were the case. So what went wrong? I can't answer that one either, but I'll speculate about it in my next post, and I'd be pleased to hear your speculations too.